Me Made May 2018 Recap | Oh Sarah O ! While I've been a beginner sewist on-and-off for the past 10 years and am a fairly proficient and prolific knitter & crocheter, I tend to put my makes on a pedestal and hide them away after I make them so they won't get dirty or ruined. Participating in Me Made May helped motivate me to take these items out of my closet and show them off a bit. Perhaps vowing to wear a Me Made everyday was a bit overly ambitious given that most of my closet is Ready to Wear. I found myself more motivated to put on a Me Made on days that I was working or running errands, and more challenging on days when I stayed indoors- perhaps I need more me made lounge wear in my closet. 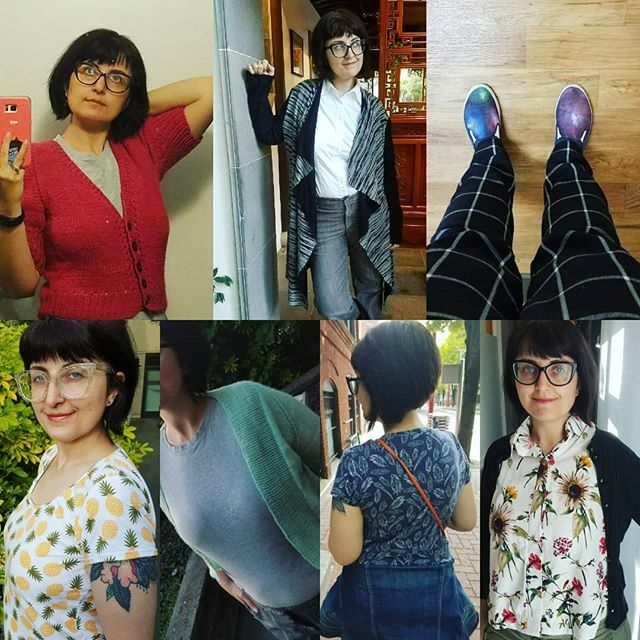 My most worn pieces were my Featherweight cardigan and my Estelle Cardigan because they were easy to chuck on. At first getting my husband to help me take outfit photos was fun, but it quickly became tedious and more challenging as the days went on. I am lacking in Me Made pants and shorts and I could use some more light weight, warm weather clothes for warmer days. Myrna Cardigan by Andi Satterlund. The yarn is Native Yarns BFL Orford. I knitted this as part of a knitting and stitching along done collaboratively with Andi Satterlund and Lladybird. Estelle Cardigan by Style Arc Patterns. This was the February Sew My Style Pattern. Fabric from Style maker fabrics. Hand painted space shoes. I made these on a whim in the early 2010s. Featherweight Cardigan by Hannah Fettig. Knit in Malabrigo Yarn Lace. Another Plaintain Tee in Girl Charlie Fabric. Shear kimono. I used a free kimono template from the internet. Brigitte Scarf by Tilly and the Buttons. I used Marimekko fabric that I got in Finland. New Look vest pattern. I sewed this up with my mother-in-law several years ago, using fabric in her stash. Overall it seems like my main focus will be on making warm weather clothes for spring and summer. Did you participate in Me Made May this year? Do you have any summer pattern recommendations? Let me know in the comments below.